The largest Swiss Army knife has 85 tools that can perform 141 tasks. 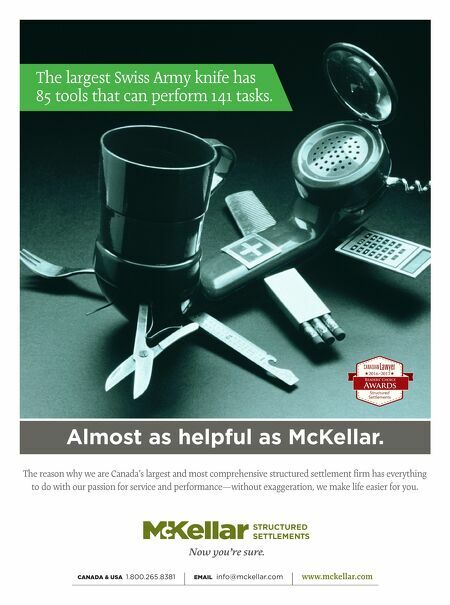 CANADA & USA 1.800.265.8381 | EMAIL info@mckellar.com | www.mckellar.com The reason why we are Canada's largest and most comprehensive structured settlement firm has everything to do with our passion for service and performance— without exaggeration, we make life easier for you. Almost as helpful as McKellar.